There's just no such thing as a well-kept secret any more. We're all too globally connected. Years ago in Rome, my husband and I stumbled - completely by accident - on a side-alley restaurant called La Cantinola Ristorante near the Villa Borghese. The prices on the menu were relatively affordable so we decided to eat dinner there. We had a lovely outdoor bistro table and both ordered the smoked salmon fettucini. The meal was extraordinary - we still talk about it. Fabulously rich and creamy and delicious, the entrées included a jug of the house wine. The next evening in Rome, we actually went back to La Cantinola and ordered the same meal again, and enjoyed it just as much. A little snippet from my scrapbook. 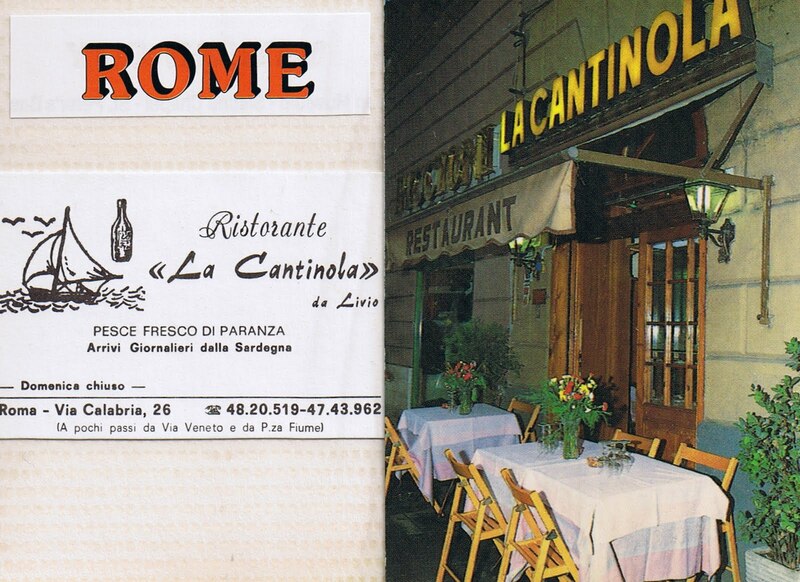 Wondering recently if anyone else had discovered our favorite little restaurant in Rome, I searched it on-line. Although the place still doesn't own a website, there were reviews on TripAdvisor highly recommending it. And I'll be darned, but two separate reviewers said that they went back for a second meal at La Cantinola, too! As far as taking kids to this restaurant, we didn't have any with us at the time. But the proprietor is very friendly and speaks English fairly well, so if you need to order lightly-buttered-noodles-cooked-very-soft-with-parmesan-sprinkles-and-breadsticks-with-no-parsley-or-other-green-specks or whatever else your child is demanding at the time, I'm sure he will do his best to accommodate. Thanks for the tip. I'm going to be in Rome with my kids for three days in August and I have taken note of the name of this restaurant so that we can check it out. We might go to Rome this summer (fingers crossed) so I'll put this place on my list. And as for it being kid-friendly, I haven't been to many Italian restaurants that aren't. They love the bambini there!